Harvard Business School Press, 9781633696112, 256pp. If you're in a job interview, how should you think about the mindset of the interviewer? If you've just been promoted, how do you handle the tensions of managing former peers? And what are the telltale mental signs that it's time to start planning your next career move? We know that psychology can teach us much about behaviors and challenges relevant to work, such as making better decisions, influencing people, and dealing with stress. But many popular books on these topics analyze them as universal human phenomena without providing real-life, constructive career help. Bring Your Brain to Work changes all that. Professor, author, and popular radio host Art Markman focuses on three essential elements of a successful career--getting a job, excelling at work, and finding your next position--and expertly illustrates how cognitive science, especially psychology, sheds fascinating and useful light on each of these elements. To succeed at a job interview, for example, you need to understand the mindset of the interviewer and know how to come across as exactly the individual the company wants to hire. To keep that job, it's critical to master the mental challenge of learning every day. Finally, careers require constant development, so you need to be able to sense when it's time to move up or out and to prepare yourself for the move. 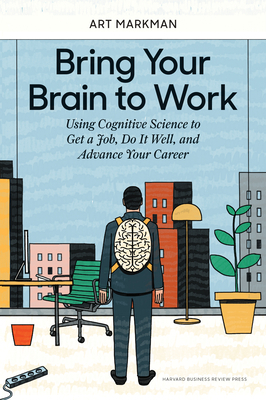 So many of the hurdles you face throughout your career are, first and foremost, psychological challenges, and Markman shows you how to use your different mental systems--motivational, social, and cognitive--to manage them more effectively. Integrating the latest research with engaging stories and examples from across the professional spectrum, Bring Your Brain to Work gets inside your head, helping you to succeed through a better understanding of yourself and those around you.